We use gluten-free ingredients in our wheatless products. We store our gluten-free ingredients in separate areas to reduce the chance of cross-contamination. We use many different pieces of equipment for our wheatless production. Due to its nature, we roll our wheatless products between sheets of plastic, further reducing the chance of cross-contamination. We freshly fully sanitize our work environment before we produce anything wheatless. 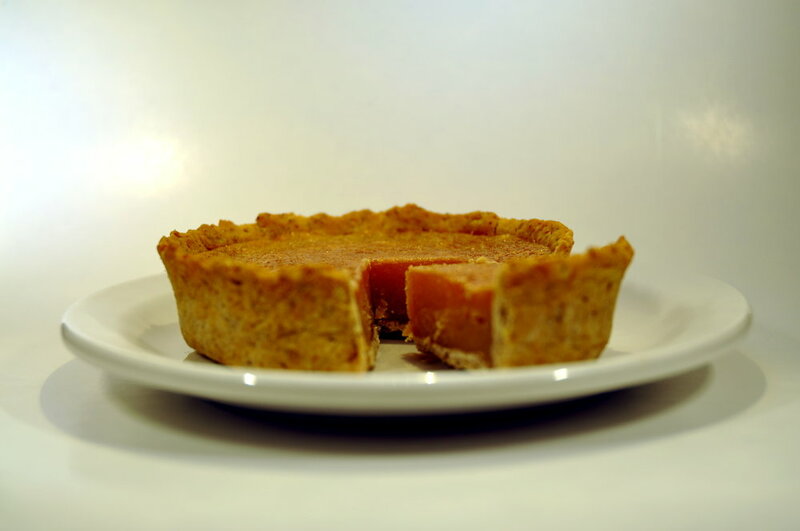 When we are making wheatless pies, we do not work with wheat flour at the same time. THE RISK: We use the same mixer for our wheatless dough as other ingredients which contain wheat. THE RISK: We use the same oven as our wheat pies, and it has a fan, so there may be wheat flour dust inside the oven during baking, as it’s in the natural environment of our bakeshop. We take many more precautions than most restaurants would in food production and cross-contamination, because we can, so if you feel safe eating at any other non-gluten-free restaurant, know that we operate with more care than they can due to business models. That being said, we have gluten flour in the environment, and we can not guarantee zero parts per million of gluten in our food. Gluten intolerance is one of the most-cited dietary restrictions we receive. In fact, when we decided to pursue something that is made without wheat, our sous chef was celiac, and couldn’t eat most of our final products. The problem was, that most gluten free products we tested were horrible. We spent months developing a gluten free pastry recipe, throwing out all the premixed gluten free flours, and doing it ourselves. It culminated in weeks of kilogram upon kilogram of discarded failures, until we started to dial in on a winner. A blend of eight different starches and flours make up our unique pastry. Unlike most gluten free products, ours continues to taste fabulous days after it’s baked. We believe this is because we don’t cheap out on the ingredients, and overload our mix with cheap white rice flour, which loses texture and moisture quickly. Most of our savoury and dessert pies are available in our whole grain crust, which is wheat-free, vegan, and bloody spectacularly delicious. We charge a little bit more to go gluten free to cover the huge increased cost of the ingredients. Some of our pies are so much better with this crust, that we don’t even offer them in a wheat crust.